And so it came to pass that in the year 1318 King Daniel, the 9th King of Scotland, found the Royal Archives to be lacking in substance and commissioned three, Anderson Buck, Arthur Scott, and James Howitt, to go into the land and examine every structure carefully, and discover its history which had not been lost to earthquake and fire. They then communicated between theirselves and set about the task. Anderson Buck went unto the regions of CUMBERLAND, ATHOLL, MAR, SUTHERLAND, and TELEMARK. Lord Arthur Scott unto STRATHCLYDE, MUNSTER, and OSRAIGH. And Sir James Howitt into ULSTER, MIDE, LEINSTER, and CONNACHT. They asked every citizen, the young and the elderly, what they knew about the various structures in their region. If you know anything about a structure in your region, please, feel free to post in this thread. If you want to participate in creating a stub like those above for each of the structures, please. Feel free to post in this thread. Greetings Arthur; the King wrote to say the two of you'd discussed the castles, and perhaps their lesser structures, and how they needed for names and information, and that I was (as well as others) invited to participate in that effort. So. I present my self to you. Have we a list of them that need for that? And perhaps we might do that work and openly collaborate on the forum so that others who are not aware but might like to contribute can? I will be traveling today to meet the King. We will discuss this matter in detail and then ill get back to you so we can plan ahead. After a long meeting with the King, we were able to classify and analyze the writings found in the Royal Library of the Lothian Castle. Although we have found work has been done in the historical research of Scottish castles, in the recent years Scotland has expanded considerably and has not been able to carry out a historical investigation on the new regions. 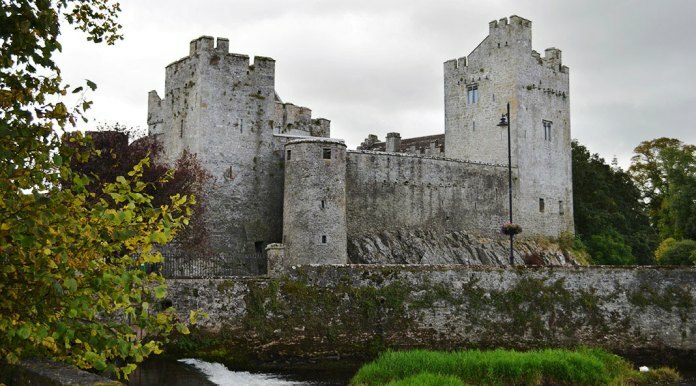 That is why the King has commissioned us to travel to the regions of ULSTER, MIDE, LEINSTER, OSRAIGH, MUNSTER, TELEMARK, and CONNACHT to begin intensive research on the castles that were built there. It will be necessary to contact local citizens, elders and any writings that may be found, in order to recreate the information of said places. It is also worth mentioning that during a recent fire, the historical respects of the castles built in: STRATHCLYDE, CUMBERLAND, ATHOLL, MAR, and SUTHERLAND have been lost. So it is a priority to recover that precious history of the original lands of Scotland. During my trip to the Royal Palace, I met Sir James Howitt, who has offered to assist us in this noble task. I would like to know to which regions you would like to be assigned. As soon as I receive your answer, I will ask the Palace for the necessary funds for your trip and, if necessary, provide more information about the tasks to be completed. Greetings Arthur; thank you for writing. I am not surprised to hear our records were consumed by fire. If I had not the steel of our Holy Mother in my spine I might be persuaded the end of days were come. Alas, but earthquakes and fire happen all the time. If the King deems it a priority to launch a full-on (re? )discovery into information regarding those, then I should unshoulder my training gear immediately, and get right to helping at that. I would not like to travel to Eire again soon. If yourself and Sir James Howitt would travel to there, and assign me the regions of STRATHCLYDE, CUMBERLAND, ATHOLL, MAR, and SUTHERLAND to me, I'd be relieved. Neither would I need any funds nor compensation to do so. I'm well acquainted with the mountain ways and know the inside of every library from here to Helm. I've some properties across the way, including an Inn in Telemark. There should be no need for one of us to travel to there; i.e. it is where I spend nearly all my time these days, crafting food. I can acquire the specific things the King will want for in that region. In regards to what the King wants for; we would write down the name of every builder, yes? And form with the aid them, the local citizens, something like a brief description? Have I understood you correctly? We may just as well collect the information of all the other "lesser" buildings when we do and make a proper census of it. Let's agree to meet in Lothian at the Royal Archives on the eve of Samhain, and bring with us all of the information we acquire, be it a piece of scrap or a lengthy scroll. Anderson Buck: CUMBERLAND, ATHOLL, MAR, and SUTHERLAND. Sir James Howitt: ULSTER, MIDE, LEINSTER, and CONNACHT. Lord Arthur Scott: STRATHCLYDE, TELEMARK, MUNSTER, and OSRAIGH. The King ordered us to start as soon as possible. So may Scotland help you on your travels. I will proceed directly, then. I set out from Lothian, where I've been training some three days, but eventually, as in after I've completed the circuit; I need to sail to Telemark and retrieve a sum of food (to help feed we Scots) and bring it back to the city. So don't feel especially compelled to go there and retrieve the info from their archives, as I said before, I practically live there when I am not training, and can make that trip with no inconvenience to mine nor yourself. OOC: I agree. We should use the historical archives. And yes, the whole chain of scrolls would be a good thing to add. As it was a nice RP. I spent several hours at our task, already, and had a great deal of fun because of it. I wanted to share with you guys that which I have. I've written to a couple people, and await any contributions (or objections) they may have in this regard. I think it's also conducive to pass around on the Active Scots channel and I wanted to take that opportunity to. If anyone doesn't know what this is, they might ask questions, and get involved. Which is a good thing. I'm particularly open on the subject of naming these. I've a few ideas, specifically the tavern in Sutherland which was built by a single man, but if you've a neat idea for a name, I'd like to hear it, as well as any thing else you might like to add or subtract. The construction was completed in April, the year 1318. It required four months to build. It has a strong outer curtain wall, ample room to support several regiments of men and house women to cook for them, a large keep gatehouse, and 7 signal-capable towers overlooking the town and countryside. It is accessible only by the spur which leads down to the landing on the River Tweed. Most experts agree that Berwick castle is probably the most heavily fortified castle in the country as it lies on the border between Scotland and England. The Market in Cumberland was completed in July, the year 1315. Before the bees died in 1317 it was known for a popular annual Fair for honey. Now it is mostly known for its raw wooden exports and finest clay. It may be worth noting, the market was ill constructed. The not so distant coast causes a shift in the wind every morning and eve so that flurries frequent the market streets and are said to be determined spirits declaring a beginning and end to commerce each day. They're also said to harass and bedevil dishonest merchants who may be passing through. Constructed in July, 1314, it is one of the eldest established public houses in Alba. Built to accommodate the immense traffic in trade, it required 7.5 months to complete. 30 meters high, it has an en suite featuring hundreds of rooms and the whole structure is dominated by the gigantic hearth which warms the great room. It's generally safe but cutthroats and pimps are said to lurk there from time to time. The harbor was built in July, the year 1318, and is one of the few which remain free of ice during the long Scots winter. It's also one of the most beautiful, if not the most beautifully engineered. Such wealth of clay on-hand in the region, the harbor is entirely quayed and capable of mooring hundreds of various ships. It's known by any of them upon the high Northern sea to be a safe harbor in storm. A wee castle in the highest of highlands. I was a mite surprised to find this little gem in what used to be called Caithness already named, actually. It was built in March, the year 1315 for Lady Lannea De Chaol Gleann, a notable priest and activist of her time. She lobbied so that women could wear heavy armor just as the men could which the Gods had until then strictly forbade and the law was changed. She then lobbied so that priests and priestesses could not only go to the battleground, but also participate and help break a few skulls as well. And the law was changed. This is, indeed, a high place in the highlands, and very wet. Moss grows thick over this place. The local economy is mostly building stone - which happens to be of the highest quality. The Barracks and Prisons in Sutherland were completed in April, 1318, taking nearly 2 years to build because, indeed, just two built it. But whoa, did they build a beast of a Barracks and Prisons, they became famous for it, and their wages were increased because of it. The barracks are bright and dry and cheerful built somewhat below the surface of the earth in a well-drained crag. Only a handful are stationed there at any time. They are well fed by the expansive kitchen and it's half-dozen larders. Clean air and water is in abundance. After only a few months of operation it was discovered there was nowhere for the prisoners to find solace or to quarry to for the lack of. Alas, the walls are all made of vitrified glass which hungrily absorbs all known manner of light, they are so deep and black. In fact, it has been described as a hopeless void, swallowing no-gooders and innocent alike, and driving them perpetually mad because they are so bleak. The barracks and prisons have had a marked impact on crime in the region. The Watchtower in Sutherland was built in February, the year 1318. Winds here are the strongest in Europe to be recorded and have been known to exceed that of 280 kilometers an hour. The roar and scream is so loud the Guardian is thankful he's mitts not only to keep his ears warm. Watchmen are usually nominated; either to find them out the strong recruits, or to cull the weak. The Tavern in Sutherland is a wide but low public house built in December, 1314, with noticeable nordic influences. The hall is lazily lit with muted rays of light from a scarce few windows in the top of it and there are scores of shield upon the wall bearing many clan's coats. Here they bring a horn and not a glass, and the roast and potatoes are as plentiful as the tales of combat which dominate the atmosphere. Rooms are affordable as there are none. Every guest sleeps near one of the fires scattered about the great. The Market in Sutherland was established in 1317. It was constructed with no plan or design beforehand. As a result, its streets sometime suddenly plunge into private gardens, and sketchy alleyways. Some of the many cairn stones about the place are known to have fallen and crushed merchants and orphans are especially numerous, so do mind thee pockets. They're generally harmless but there have been incidents, one which gave rise to a persistent rumor alleging the children sometimes nap a wayward browser and eat them. It's very likely this rumor has no foundation in truth, however, for dogs and cats, in their ain right, are suspiciously rare. Harbor Level 1 plopped there by the Gods during the 1311 earthquake to demarcate a fast-track path. Project History already recorded by Bruce Enderson. The Barracks and Prisons of Inverness were built in April, the year 1315. It is a lively depot to the Yellowshirts and often accomodates civilians, as well as wounded soldiers while they convulesce. It is also a military school for Scotland's elite, and a school of reform for the delinquents. The grounds has a parade for the viewing of tattoo, a theater which often hosts a comedy troupe, and an amphitheater for the brass orchestra to practice at. Life in Moray often revolves around this structure. The Watch Tower in Moray was built in early 1315 to facilitate them in reducing theft in the surrounding regions. From atop one can see up and down the lochs region, and all around into the (now non-existent) places like Ross and Buchanen where iron and gold are still abundant. It's very unadorned and entirely functional keeping the rain off one's head. Possibly one of the more enviable posts. The Three Arrows Tavern in Moray was built by the Bowman clan in May, 1312, for the three arrows on their coat. Moray was the second largest, indeed the only other city in Scotland besides Edinburgh, during this period and the Bowman clan was its most prominent. They enjoyed a tremendous summer, accomplishing much in the way of building the city, even hosting world reknowned princes and pirates at the Tavern, until the winter returned. The winter that proceeded was the harshest in record killing a third of Scotland's citizens, and with it every last Bowman. The Ancient Teological Parish Church in Moray was built the 14 of May, in the year 1317. Three days prior a Pagan shrine had existed in the same location. It took a team of nine, lead by Brother Greendragon Storm, exactly 3 days, 23 hours, and 48 minutes to tear down the offensive shrine and build the wee Parish instead so as to avert a war with the Russians. It was immediately and properly christened with a celebration including juicy steak and copious wine. A good time ensued by all accounts. Adding the research of STRATHCLYDE, MUNSTER, and OSRAIGH castles to our archives. The Strathclyde Castle is located on a high and steep bank, up to bend over the Clyde River. From afar, you can see a huge cylindrical donjon, followed by a Great Hall to the east. The Courtyard is surrounded by long curtain walls, with round towers in the south-east and southwest corners. From the main tower you can see the village of Strathclyde, the cow farms and the market. The region is not very developed yet, but with some new citizens, it would have everything it needs to become a great city. The tower house has square bartizans on diagonally opposite corners and a thick end wall. The tower is surrounded by a square bawn defended by round corner towers on each end. The structure is stacked and mortared stone with thick walls and providing five inner stories plus the roof. Castle Windows at the lower levels are vertical thin slits that prevent entrance into the structure but allow the garrisoned soldiers to aim and fire arrows at attackers. The front entrance is a small anteroom secured by an iron grill at the outer wall. The iron grill can be closed from inside via a chain that can then be secured even if the front door is closed. This room provides small side access holes and a "murder-hole" above which allow the defenders to attack anybody in the room. The castle location provides a great view of the region's harbor, taver and market. In the opposite side of the town, a great watchtower was built to provide coverage. It is said that during a raid, big part of the region was set on flames, which destroyed its only natural resource. 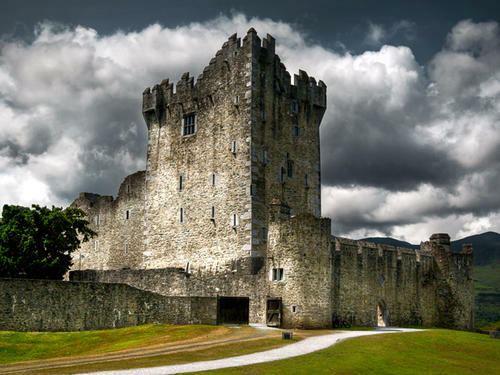 Three square towers and a circular one are scattered in a seemingly random pattern, but have been build for an ideal defense and are connected by enormous, solid walls made of stone. A sizable gate with enormous metal doors, a regular bridge and a moat protect garrisoned armies, and it's the only way in, any other side would be futile. This castle shows signs of damage and repairs as some parts are clearly build more recently than others, the construction itself took many years to be completed, most likely because of the constant raiding and plunder in the area. The town consists only of two buildings, a tavern and a market. While outside town a few pig farms can be seen aswell. Excellent descriptions, Arthur. I like your things, they are a lot more grounded than mine. I have the tendency to use the barest description. I base them loosely upon existing castles, but not entirely. My reasoning behind this is we live in an alternate world than the Europe we know as players, and I would allow them that come after and want to roleplay at the location the same liberty which I had in inventing the history and description. I also like to insert some plot device which might spur somebody's imagination and make for a good roleplay. I write some pretty absurd stuff, even. But there are sometimes less... fantastic explanations for those things. Onside of this structure are the words Ingrid's First Castle. Atholl is home to at least a score of them, a series of defensive strongholds some on top of, others astride, majestic mountains interconnected by miles of highway after the auld roman variety, and curtain walls which stretch as far as the eye can see, regulated by a number of tollbooths which direct the traffic from the busier lowlands unto the lake lands. Some strongholds are no more than warm hall and hearth, but more than a few hem entire thorps and villages situated above mines for this country has two resources in abundance only. Iron. And Ice. The Cairngorms did at one time support a large number of sheep herds. But when winter settled over the land in 1317 it put down icy roots and stayed. Today glaciers roam instead, toppling walls and devouring the last few patches of tree that remain, and the temperatures vary wildly. It is not unusual for snow to fall in July. Exhausting stretches of tundra are punctuated by towering smoky mountains and misty ravines carved by torrents of water leap from rocky places to plunge so deep into the black earth their terminus cannot be determined. Surprisingly, flowers do grow moderately well here. One, a not-well-known and novel purple variety of thistle, grows especially so. Atholl is the stuff of romantic adventures. And ogres. There has been no new construction since Christmas of 1317. This is a list of some of them that contributed. Berwick Castle was completed in April, the year 1318. It required four months to build. It has a strong outer curtain wall, ample room to support several regiments of men, as well as officers of men, and houses women to cook for them, a large keep gatehouse, and 7 signal-capable towers overlooking the town, its market, and countryside. It is accessible only by the spur which leads down to the landing on the River Tweed. 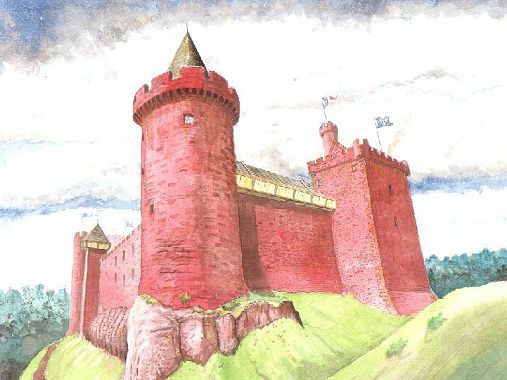 Most experts agree that Berwick Castle is probably the most populated and heavily fortified castle in the kingdom, second only to the one in Edinburgh, as it lies on the border between Scotland and England - though there has never been a war waged betwixt the two in the history of this world. Life is not entirely uneventful at the castle, though. It is rife with the rumor of supernatural things. Soldiers stationed there report that the drink from their cups often mysteriously evaporates without having been spilled nor drunk. They also warn recruits not to be seduced by Auld Lady Kirk who wanders the green feeding on virile young men. She is said to have beautiful red hair alike the colour of whisky and enchanting green eyes, and wears clothes of a fashion not of this century. Other times she may bear a witch's bridle, sometimes a length of rope about the neck. A few servants, reluctant to be named for fear of reprisal, tell of missing objects, ghostly whispers, and knocking on the back of looking glasses. They say the odor of sickness can be detected in the uppers when the hour is right, and the sound of distant sneezing or coughing can be heard. The place is possibly haunted, and the disappearance of the bees in 1318 lends even more mystery still to the locale. Aberdeen Castle is a relatively new one built upon a high and lonely crop of rock in the east of the city surrounded on three sides by the sea. It is little more than a keep, having no motte, nor bailey, no curtain, nor moat. It was designed to be a comfortable and dry space to live in one of the wettest environments of Medieval-Europe. At night it is lit up brightly, and is said to be a place of merriment. This may be true for the present but it was not always thus. Those still alive who experienced the Great Shake in 1311 say that in those days there came out of the sea a blubberous thing having no persistent shape nor bones moving alike a sack of wet wool or sand most ghastly to witness. They dubbed it the "Frittening" and reportedly it was able to become the size of a mouse, and when it wished, as large as a house. It possessed one lidless eye upon the end of a stalk which it used to paralyze any living thing and for some weeks harassed the livestock in the area by ambushing the creatures and then engulfing them with its amorphous body. Eventually, it graduated to the city, and began preying on the citizens after dark. The folk had to hunt it out by fire, burning most of the dwellings on the north and east side of Aberdeen as they did, until it retreated again to the sea. It was done in after much determination by boiling tar and rude farming tools, and according to the legend, the carcass lay there, hardening and congealing until moss and rock grew upon it, so that it became what is the high hard crop of them today which the castle is built upon. Sutherland lies beyond the highland and the lake country. It is a place of winding strands and windy straths and moss grows thick over every thing. It is the uttermost northwesterly location in Medieval-Europe but its inhabitants, a sort of Norse-Gaelic people, call it the South Land (sometimes the Island Kingdom) and cling to auld superstitions alike force-fires and the Althing. The local economy is mostly building stone - which happens to be of the highest quality and incorporated in nearly every structure - and some notable settlements are Helmsdale, Wick, Orkney, and Shetland. Sutherland Castle lies on the east shore, a few hours sail to Inverness, above a small lonely fishing port and aside a lazy frigid river. It is little more than a stronghold to keep a Lord or Lady comfortable, a ring of massive stones to host the aforementioned Thing, and a few scattered longhouses to facilitate the people's industry. It would be disingenuous to suggest there is a castle in Telemark. There is not one. Rather, there are hundreds. Perhaps even a thousand. Citizens of Telemark are known for their stalwart independence, conservative values, and strong opinions. As such, every home is a castle, every farm a fortress, every harbor a defensible port. That is the manner of their construction. If one were to invade Telemark they would, behind every bough or blade of grass, find a man or woman or child prepared to do battle unto the death.